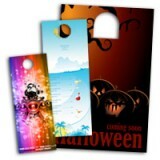 Door Hangers help you maximize your marketing impact efficiently. They are at the pinnacle of effectiveness in this rapidly evolving world of direct marketing strategies. Get full-color door hangers on 100LB Gloss, 14PT or 16PT heavy card stock with UV coating or aqueous coating also available water proof 10PT door hangers.